Prime Minister Lee Hsien Loong announced Singapore’s intention to nominate Hawker Culture on the UNESCO Representative List of the Intangible Cultural Heritage of Humanity at the National Day Rally 2018. Hawker Culture includes our hawker centres, our hawker food and the hawkers themselves, and has become an integral part of our Singaporean identity and a reflection of our multi-cultural heritage. Your support matters. Strong community support for the nomination of Hawker Culture is integral to its success. Visit www.oursgheritage.sg to pledge your support, or simply scan the QR code below on your mobile devices. SINGAPORE — A 14-member committee has been appointed to oversee and guide the effort to nominate Singapore’s hawker culture for inclusion in Unesco’s intangible cultural heritage list. The heads of the three organisations — which are driving Singapore’s effort in nominating its hawker culture for the Unesco Representative List of the Intangible Cultural Heritage of Humanity — will co-chair the committee. They are Ms Chang Hwee Nee, chief executive officer (CEO) of NHB, Mr Tan Meng Dui, CEO of NEA, and FMAS’ president Yeo Hiang Meng. “The committee will also offer ideas that will help strengthen Singaporeans’ pride and love for hawker culture, and encourage widespread participation from the community in supporting Singapore’s nomination of hawker culture,” the agencies said. The committee — which has tenure for 2.5 years — will provide recommendations, feedback and advice on the nomination documents to be submitted to Unesco in March 2019. The decision to nominate the country’s hawker culture to be on the coveted Unesco list was first announced by Prime Minister Lee Hsien Loong at the National Day Rally this year, where he spoke about hawker centres being a unique part of Singapore’s society, heritage and identity. In Unesco’s assessment of the nomination — and for it to be successful — strong community support by Singaporeans is crucial, NHB, NEA and FMAS said on Monday. 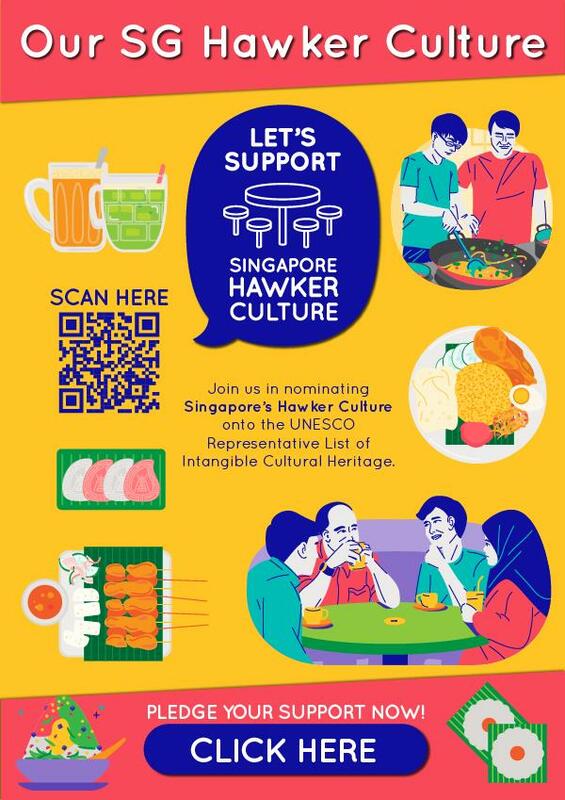 As part of the public outreach initiatives, Singaporeans may pledge their support via www.oursgheritage.sg, for the country’s hawker culture to be inscribed as Singapore’s element on the Unesco list. The public may also learn more about the hawker culture through a travelling exhibition — titled Our SG Hawker Culture — which will run from Oct 26 until Jan 31 next year. The exhibition will be held at more than 10 locations islandwide, including Tiong Bahru Market, Our Tampines Hub, Yuhua Village Market and Food Centre, Kampung Admiralty Hawker Centre, as well as selected public libraries and malls. Among the members of the newly formed nomination committee is Mr Jesher Loi, the branding and marketing development director of Ya Kun International, the company behind the Ya Kun coffee-and-toast franchises. Mr Loi, 33, is active in the arts and youth sectors and has championed youth interests through the National Youth Council’s initiatives. Another committee member is Ms Denise Tan, director of the School of Hospitality at the ITE College West. Ms Tan is also on the Hawker Centre 3.0 Committee, which was tasked to find ways to improve the design and management of hawker centres and to promote the trade. Other committee members include Dr Jack Lee, president of the Singapore Heritage Society, and Ms Anne Loh, president of Slow Food Singapore, which aims to promote and safeguard Singapore’s food cultural heritage. “With their involvement in the committee, Dr Lee and Ms Loh will help support the nomination journey by raising awareness through their respective organisations, and contributing ideas towards strengthening support for our hawker culture,” the statement added. Since Mr Lee’s announcement on the nomination bid, more than 30,000 Singaporeans have pledged their support online at www.oursgheritage.sg.